Designed for those with superior knowledge? 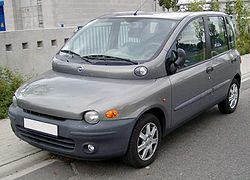 When Fiat‘s multipla was launched in 1998 it was hailed as a triumph of modern design. The high headlights were an ergonomic stroke of genius. It reaped so much acclaim that it was even put on display in the New York Museum of Modern Art. Yet it was a sales flop. Strangely, despite all the praise from designers – who are obviously superior to me as a lowly car driver – in 2004 it underwent a major facelift. The objective: to shed its original styling for a “more restrained look”. The ultimate aim: to attract more buyers. Just goes to show – sometimes you should listen to your buyers, not people removed from reality in an abstract world of “art” and “modern design” (whatever that is). Did they do focus groups? Did they conduct any market research?